Trio Goya play Classical-era chamber music on period instruments. 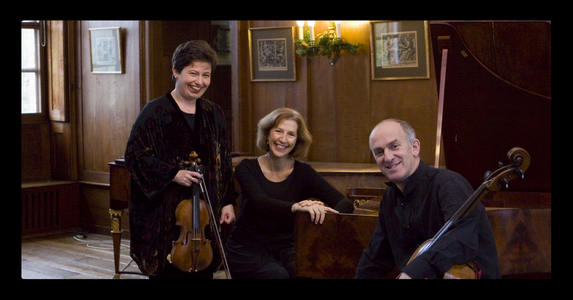 Formed out of a collective fascination with the rich and innovative trio repertoire that echoes the artistic development of Francisco Goya (1746-1828), the group concentrates its repertoire on the trios by Haydn and Mozart and the Beethoven opus 1 set. A fortepiano by Paul McNulty after Anton Walter, Vienna 1795 is the centrepiece of this music and a later instrument can be supplied for Beethoven from opus 70 (including the Ghost and Archduke Trios) and Schubert. Programmes can also include the three fine trios by Mozart's friend, the English stage composer Stephen Storace, Mozart's two dramatic fortepiano quartets and solo works for each of the three instruments by the aforementioned composers as well as their lesser-known contemporaries. Invited by Real World Studios to make a recording for their innovative download collaboration with Bowers and Wilkins, Trio Goya’s CD of Haydn trios, The Heart of Invention was subsequently released on Chandos Records to extensive critical acclaim.